The Celebration Singers is the youth choir at Tucker First UMC. It is for youth in 6th –12th grades. The choir rehearses on Sundays from 5:00 to 6:00 p.m. during the school year. 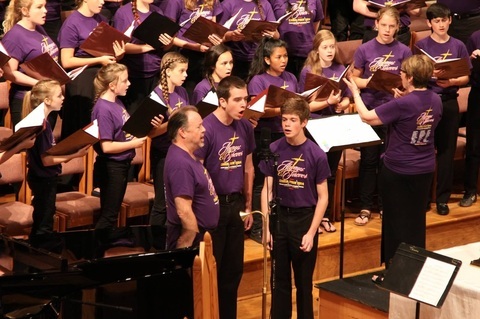 In addition to serving their church by singing once a month in worship, the choir also travels on an annual Choir Tour at the end of the season. In past years our Youth Choir has represented our church in Alaska, Nova Scotia, Houston, Chicago, St. Louis, Seattle, Vancouver Island, Niagara Falls, New England and most of the Southeastern United States. Ministry through music remains a high calling for these youth who are committed to serve their Lord and His Church through participation in this fine traditional music program. Our purpose: We believe that we minister to others through our music. Touring is an important outreach ministry which allows us to share our faith with others. We believe that we represent our church and the church universal by projecting a very positive image of Christian youth today. We believe each member of the choir grows spiritually and emotionally through the daily responsibilities of caring, sharing and reaching out to those around us. We believe that we grow as a group by being together, getting to know each other better, and accepting each person in the group as a unique child of God. We believe the music we learn and share makes a difference in our own lives and the lives of those who hear us.